Sorry this is going to be a long one, but I love amusement parks! I love their smell, all warm caramel corn and hot sticky tarmac. I love the butterflies and excitement in my stomach, super full of candy apples and cotton candy, as my hands clench the bar across my waist and my dangling feet feel twice their size and somehow heavier when I’m suddenly flung into the air, so quickly at first that at the climax of the ride I almost experience a moment of zero gravity, a moment of suspended animation, like slow motion. For a brief second time stops and I’m thrust back into my seat only to begin again on my way back to the top. You probably wouldn’t even notice me with my hands up in the air, squealing with the zeal of a twelve-year-old, because I’d be one of thousands that frequent these kinds of parks everyday. With me the funny thing is: normally I’m mortified of heights. With one exception, for some reason my mind gives me a free pass when I want to go on a roller coaster or the Octopus of Terror. What’s the one exception? The Ferris Wheel. That ride has always terrified me. Could it move any slower? And the way down makes me feel like I’ve been tossed off a 4 story building. But the tiny, itty-bitty Ferris Wheels of today are nothing compared to the monolith that was built by G.W.G. 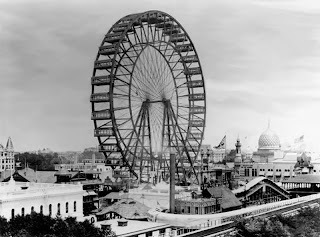 Ferris for the Chicago World’s Fair in 1893. The first of its kind and built to rival the Eiffel Tower at the 1889 Paris Exposition, you can see from the following picture it was meant to be the focal point of that great fair, America's first amusement park. At 26 stories high, and with 70 tons of steel, this marvel of engineering at the time had 36 cars and could hold up to 2160 persons, 60 to a car. It took 20 minutes to make two revolutions. The cost of what for me would’ve been unadulterated terror was 50 cents a ride. People had never seen anything like it before. 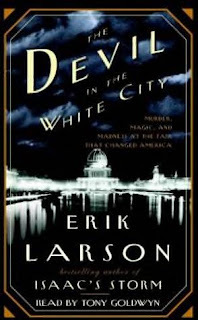 According to Erik Larson, author of The Devil in the White City, this was the fair that changed America. Thought up and designed by that great architect, Daniel Burnham, and with a team of thousands, it took less than two years to finish. Miles in size and built along the cusp of what was then the second largest city in the country, battling bad weather, disease, death and fire, after reading this book I’m inclined to agree with him. This team of architect wizards were some of the first to think up using hundreds of electric lights at night (hence the name, the white city), a decent water purification system, beautiful landscaping, Cracker Jack popcorn, Juicy Fruit gum and hamburgers, just to name a few. This fair was a slice of Americana at the time, an engineering wonder. People came from across the country to see it, even during an economic crisis. Some traveled with their families; some alone and looking for a new start. Hundreds of people unloaded from the trains in Chicago never to be heard from again. Easy prey, for a determined predator - Herman Mudget, aka Dr. H.H. Holmes. The devil. A small part of this book is about him, one of our nation’s first documented serial killers and one of the reasons we now have the term psychopath. He preyed on helpless, obviously insecure women and children. Yes, children. He killed them too. The man was the hidden monster under the bed, the one parents always deny exist; the World’s Fair his playground. Reading about him was dark and chilling, his behavior almost so preposterous, his victims so naive, that I thought I was reading fiction. Woah. I've never heard of this ferris wheel or this serial killer. This sounds really interesting. Was it nonfiction, or fiction based on fact? It was interesting for the most part. If you like learning about early American architecture, how they built things, dealt with problems, etc, then you'll like this book. It's mainly nonfiction, but the author does do a lot of speculating with Holmes. The guy was completely crazy, and such a sweet talker. I found it amazing that such an evil mind could have such a reverse of personality as to convince so many people to actually love him, leave with him, marry him (he was married to like 4-5 women at the same time), let him take their children on road trips. Were the women back then just complete idiots?? And isn't that Ferris Wheel cool. It's huge! In the book it goes over how he built it. Absolutely amazing. i like the way Larson interweaves two separate stories in his books. one lurid; the other technical. the World's Fair parts of TDitWS are well-written. you really can visualize what it looked like. i was impressed with the detective who finally brought Holmes to justice. how he reconstructed the trail, and eventually found out what happened to the kids. if this had been fiction, we'd say the crime-solving wasn't believable. Did you do a review of this book somewhere? I'll try to find it and add it at the end. I liked the end too, with the detective, but it felt too hurried. I'd have liked even more details about how he figured it out. It was incredible, almost beyound belief. Finally someone had got that guys number. in back-checking. i reviewed Isaac's Storm, my initial Larson book, on my own blog. another Larson book, Thunderstruck is reviewed here. i read The Devil in the White City in between those two. at the time, i was reading books a lot faster than i was posting about them. 5-Squared has motivated me to keep my "To Be Reviewed" list up to date. Reading that descrption about the killer sent shivers through my spine. This sounds like an interesting read as I'm just like you - I love amusement parks, no matter how old I get, but the ferris wheel terrifies me. Hamilcar - too bad on that review, but lucky you. I'm currently five or so behind. Lady Lazarus - I know! Does anyone like that stupid ride? And yes, that guy is super creepy. Larson does a good job of getting into his sick head. Very chilling. I love the Ferris Wheel!! It's so mild compared to most rides. The ones I hate are the spinning, nausea-inducing ones. I don't care for the spinners either. Maybe I dislike the Ferris because of the freedom to move around your seat. Being mortified of heights like I am, that might just be too much. Last year I saw footage of a disabled teen who got out of his cart while it traveled over the top. He hung from a bar forever before they rescued him. Broke his arm partially falling half the distance. Scary!